Reviews of the Canon PowerShot D20 from around the web. 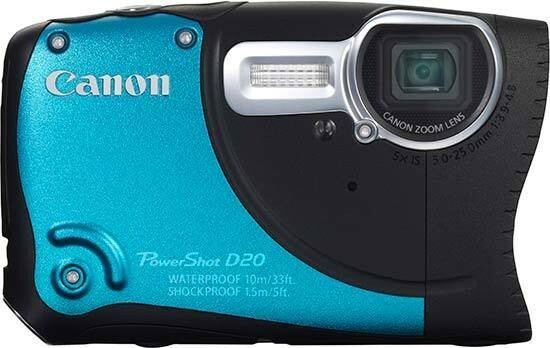 Canon's second underwater-dedicated compact camera, the PowerShot D20, is chocked full of impressive features and functions that include a 12.1MP HS System, a 28mm wide lens with 5x optical zoom, GPS tagging, Full HD movie quality and a bright 3-inch LCD display. If you want to buy a rugged, waterproof camera, the Canon PowerShot D20 is the one to go for. It's easy to use and comes in a choice of three colours. Build quality can't be faulted and the buttons are responsive, with a satisfying action, unlike those on some rivals. We’ve tested a whole bunch of tough, rugged and waterproof digital compact cameras. They may well be shockproof, freezeproof and dustproof too, but, truth be told, no company has got the full package quite right after many years' worth of attempts. Can the Canon PowerShot D20, the company’s update to the PowerShot D10, with its radical, almost wave-shaped design change this?